T.S. Dharmarajan, MD, is the Vice Chairman, Department of Medicine, Clinical Director, Division of Geriatrics and the Program Director, Geriatric Medicine Fellowship Program at the Wakefield Campus of Montefiore, the university hospital of Albert Einstein College of Medicine. 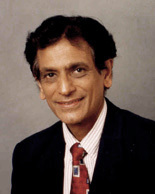 He is currently Professor of Clinical Medicine, Einstein, and also an Adjunct Professor of Medicine, New York Medical College.